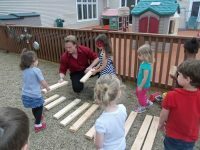 Kendal Early Learning Center is located within the Kendal Northern Ohio Care Retirement Community. Kendal Northern Ohio is an affiliate of The Kendal Corporation, a national leader in the field of aging, providing services and communities for older adults in 8 states, and operating with Quaker principles and practices. Kendal at Oberlin serves more than 300 residents, bringing generations together through opportunities for growth and lifelong learning. 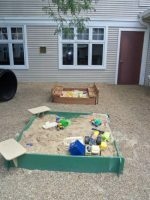 It is the mission at Kendal’s Early Learning Center to provide the families of on-site employees and families from the surrounding community with a high-quality educational program. Children enrolled in the program are welcomed into a wide variety of wonderful intergenerational experiences such as: greeting a resident friend on the way to explore on the Kendal grounds; delivering a special valentine or get-well card to a special “grand friend”; experiencing the one-to-one support of a resident volunteer during the morning preschool curriculum; shared community spaces including the center courtyard garden where children can pedal tricycles in the midst of beautiful flowering (resident-maintained) gardens and visit with nursing home residents enjoying the sunshine; and of course, celebrating community events together. Residents in the retirement community also use the space while spending time with young family members that visit them. 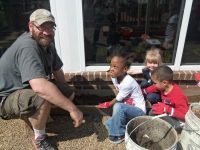 Kendal Early Learning Center is the first Certified Nature Explore Classroom located within a multigenerational facility. KELC involved teachers, children and families from the beginning of the planning stages by first, asking questions on what they would like to see in the play yard. Feedback was then put into sketches and the decision was made whether these ideas could be incorporated and put into action. Using the principles of dividing space into delineated areas, staff used names from the Nature Explore Resource Guide to label each area. 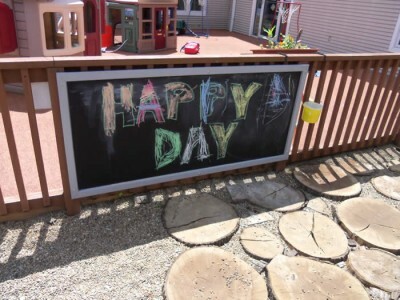 Working with their on-site wood shop, signs were made by residents with labels to assist staff, children, and their parents in understanding each area and its use. Rearranging their space and grouping like items together helped make the space more calming. Two sandboxes were moved together and the bikes and houses were placed together to create a little town-like atmosphere. 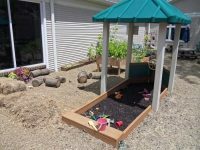 Using a variety of durable, natural materials found to withstand Ohio weather and recycled materials from the community, the outdoor classroom at Kendal was transformed. 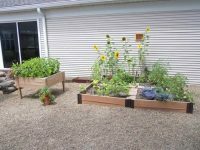 With the help of parent volunteers, raised beds were built for gardening and discovery and tree slivers were cut to be used to create a space where children could build or create with blocks. 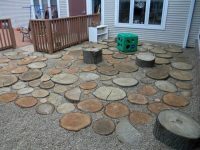 Large tree trunks were placed around an existing tree for children to climb or sit on. 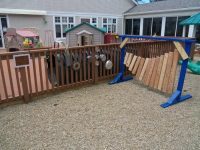 One father made a xylophone out of wood for the Music and Movement Area.